This quest is available from level 6 onwards. This used to be the very first quest line in the game, now it's the second. You're given 2 days (shown as 1 day and 23 hours remaining) to complete this quest and receive the Wedding Bundle. If you do not manage to complete this quest in time, you still have access to marriage. Note: some of the times mentioned might be different from what you'll see. Objects with a high (3-stars) ratings take less time. To see the ratings, check the home-store or tap the object (the rating is in the title at the top). This quest has been last verified on the Glitz and Glam update (Sept. 2015). (One of your Sims needs a shower to get them in the mood for a fresh new romance. [This task used to be before reshuffling: Is it just me or does this goal look different. Oh, this must be your first quest! What's a quest, you ask? 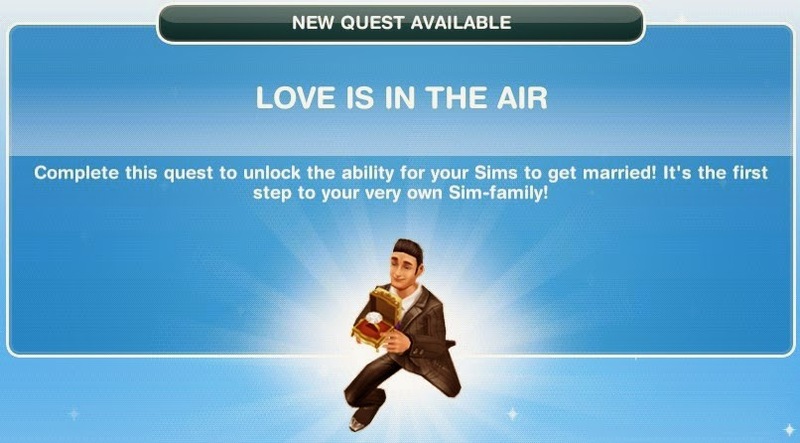 Each quest is a new story, sending your Sims on an adventure to unlock awesome new content. Let's get started! 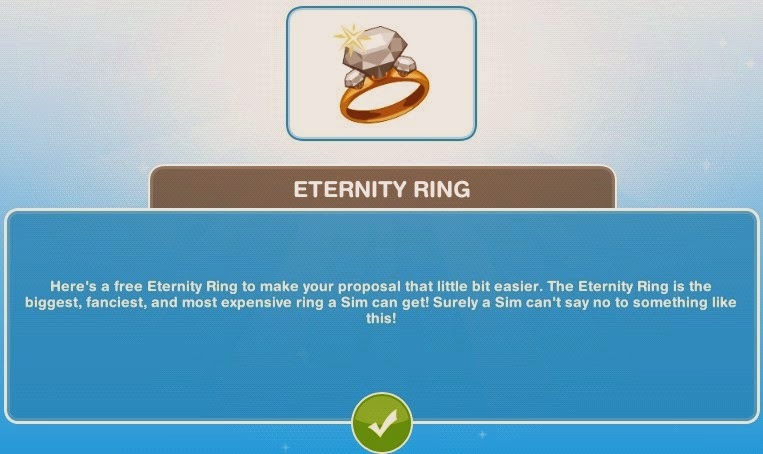 (Sims should show their intentions for love early! Have a Sim 'Be Romantic' with another Sim! (It looks like they're really getting along! They should get to know each other a bit better over a coffee. Have a Sim make an Espresso. (Your Sim just had a great idea! Everybody loves an emotionally mature Sim, right? And how do you create an instantly-sensitive Sim? By growing onions, of course! (Oh dear! Your Sim in their haste to see their love again neglected to scrub their hands properly! Bad hygiene is always a turnoff! (Success! Share the big news! 'Call about Engagement' on a phone to tell every Sim. (Time to make the big commitment! 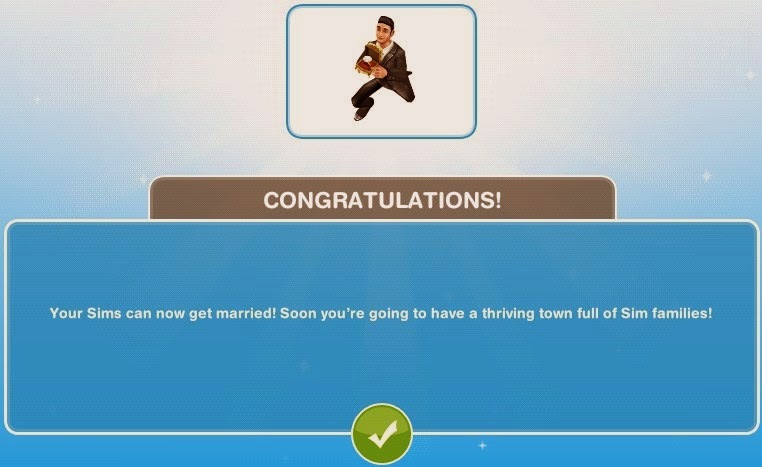 Have two engaged Sims get married! 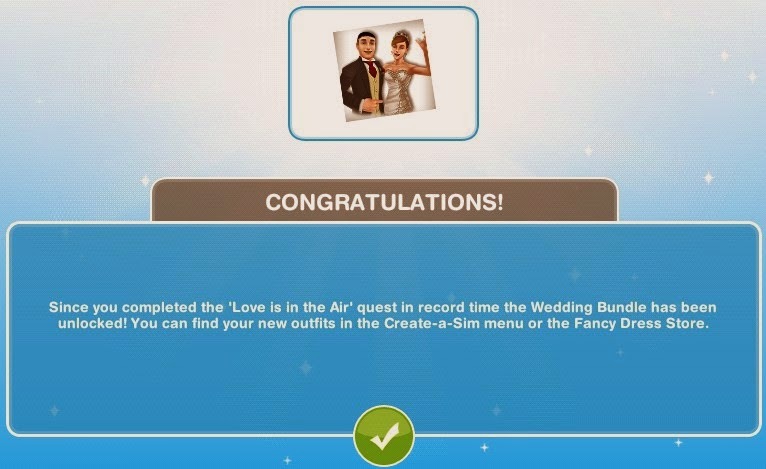 Since you completed the 'Love is in the Air' quest in record time the Wedding Bundle has been unlocked! You can find your new outfits in the Create-a-Sim menu or the Fancy Dress Store.